Costa Rica May rainfall patterns. This map may be wetter than actual conditions. The latter part of May is the beginning of the rainy season in Costa Rica. 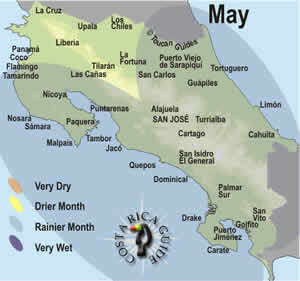 What’s the Weather Like in May in Costa Rica? May marks the transition from the dry season to the rainy season in Costa Rica and the weather is a bit of a gamble. We’ve marked nearly the whole country as rainier on the map, but just a little bit (super wet 2018 was an exception). We’re going out on a limb and saying 2019 will be a bit drier than average. Typically the weather starts out dry but by late in the month rainy season weather patterns are once again prevailing. The rainy season normally comes on slowly. Some rain in May, a few more rainy days through June and so on until sometime in October or November it’s pouring all the time and then suddenly it’s over in December or January. This pattern means May is a transition month and beach vacation weather isn’t guaranteed. We saw the dry season hang on until June in the drought years from 2013 to 2016 but May 2018 was the wettest ever on record in Costa Rica with heavy rains, flooding and landslides hitting particularly hard in the central mountains, San José and the normally arid beach areas of Guanacaste and Nicoya. The lowland and Pacific beach temperatures in May depend a great deal on when the rains start. Early in the month it may be more like dry hot April with highs well into the 90’s (32-36 °C) but once the season switches it’s more like June and a few degrees cooler. Elsewhere in the country average temperatures are less impacted because it’s rained at least a little in April. Highs are in the 80’s just like most of the year. The rains are more consistent on the Caribbean side of the central mountains and it’s generally wetter. Afternoon and overnight showers are common in May. May is gaining popularity for Costa Rica travelers, but it’s the beginning of the low season. Advanced reservations may still be necessary for some of the more popular hotels, but if you want the flexibility of traveling without an itinerary set months ahead May is a good choice. As the rains start, the number of travelers decrease and so do the prices – lodging discounts of 10-20% are available in May although transportation and tour costs are relatively constant. November is the opposite transition month when rainy season ends and the dry season begins, but we’ve found that it’s much more of a gamble. Really wet weather is not uncommon in November and because the ground is saturated with months of moisture landslides that close down roads for weeks or even months are not uncommon. Alternatives with low season prices and intermediate rainfall include June and August. May weather is normally a bit unpredictable starting out drier and gradually welcoming the rains by the end of the month. Currently NOAA is predicting that the mild El Niño pattern which developed in January is likely to fade to a “La Nada” (technically called El Niño Southern Oscillation – Neutral) pattern which amplifies unpredictability. approximate exchange rate ¢623 per $U.S. Día de los Trabajadores – Labor Day. Parades, marches and the Presidential “state of the union” address to Congress and the people. Cricket matches are a highlight in Puerto Limón. Día de San Isidro Labrador – Escazú and San Isidros all over Costa Rica hold street fairs and parades with music, dancing, traditional food, honoring the patron saint of farmers with blessings of animals and crops.